Auchtoon! » It’s Finally Here! 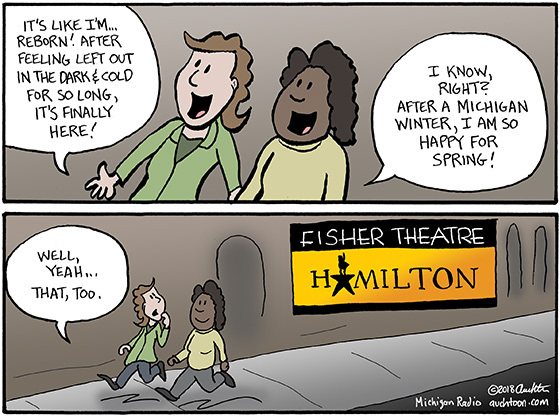 But in the meantime, if you have the opportunity (and the means), I would highly recommend seeing Hamilton. This week I have been at a global sales convention for my day job and meeting colleagues from around the world. Hamilton has been on my mind and I have suggested to a few international friends that if they are interested in understanding Americans better, seeing the play (or at least listening to the music) is a good place to start. It’s a quintessentially American story: an ambitious young immigrant makes his way here to start a new life. He works hard, finds opportunity, achieves success, overreaches, fails, rebuilds, repeats. And the play itself is uniquely American, too. Diverse, charming, quickly accessible but sometimes hard to understand. It moves in an almost constant churn, appeals to your pride, and breaks your heart. Mistakes are made with the best of intentions and the consequences are sometimes terrible, but the intoxicating idea of creating something new carries everything forward. Anyway, I think experiencing the show is highly worthwhile. And I can’t promise that I won’t make a Hamilton reference again in the future, so it would help me out if I could count on you guys being in on the joke.